Today's post features a fabulous living room submitted by belle maison reader Fran. In her email, Fran said, "I am a huge fan of belle maison, it's one of my very favorite interior design blogs! It has most definitely inspired me through the decorating process of my apartment...I've attached a photo of my living room..." I'm so happy to hear Fran's found inspiration for her home through my blog - that's why I do what I do :) I love the fresh color palette and modern furniture style - everything flows nicely. I'd like to know what paint color she used for that fantastic accent wall?! 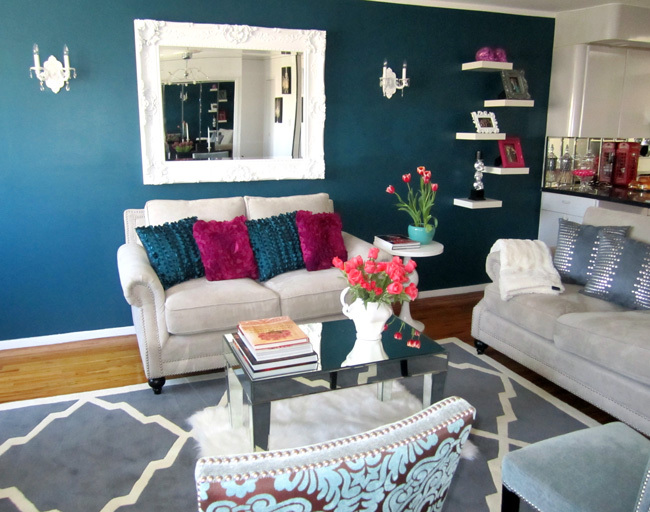 The crisp white mirror, floating shelves and sconces really pop against the blue. And the fuchsia accent pillows and accessories add a little flair and excitement to the space. Thank you so much for sharing, Fran. I'd love to see more reader's homes, so please feel free to submit your own photos for consideration to be published on belle maison! What a cute room ! love the rug...where is it from ? Adorable!!!! Quite the impact. Loving it! i am loving the color of that wall! i am also loving your blog. The colour of that wall is GORGEOUS! I love the contrast between the dark wall and the white accessories! so beautiful, fresh and chic. Definately a nice work Fran.